Halloween Hangover: a spooky movie night! We’ll nurse you back to health after your weekend debauchery! 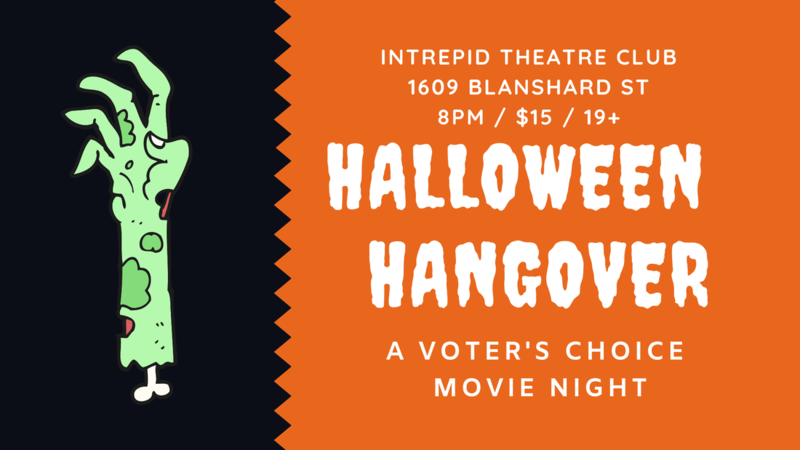 Impulse Theatre hosts the spoookiest of casual drinking nights with Halloween Hangover. We’ve cued up two old fashioned, terrible horror movies and we’re relying on you to decide which one to watch. Answer the poll below and cast your vote. Voting closes on October 29th. Once we’ve decided on the movie, we’ll make the game. Think audience participation ala The Room or Rocky Horror picture show! Come play along! ‘The Brain That Wouldn’t Die’ or ‘The Screaming Skull of Giant Leeches’? Vote on facebook or by email to info@impulsetheatre.ca. Winner chosen Friday, October 26th, 2018. Prop-kits will be available for purchase onsite for $5. Halloween Hangover supports Impulse Theatre’s Peek-Fest (www.impulsetheatre.ca/peek-fest) and our Peek-Fest Access Program which sponsors workshop fees for QTIPOC artists in Victoria. Intrepid Theatre Club is wheelchair accessible and hosts two gender inclusive washrooms. This event take place on the unceded and traditional territories of the Lekwungen peoples, now known as the Songhees and Esquimalt Nations.